Geoffrey (Geoff) Tuson is our talented rehearsal accompanist. Geoff began learning the organ at the age of 14 with John Belcher. He then spent a total of six years from 2004 -2010 studying at the Royal College of Music in London with Margaret Phillips during his undergraduate degree and subsequently with David Graham and Sophie-Veronique Cauchefer-Chopin whilst completing his postgraduate studies. 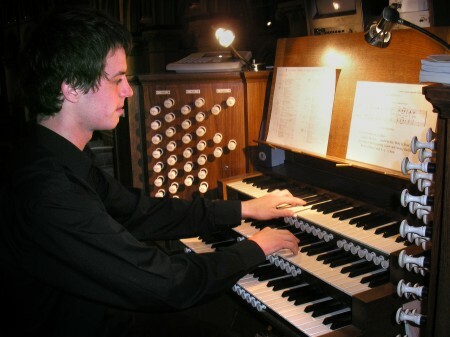 He was awarded the Harold Darke prize for excellence in organ performance on completion of his undergraduate degree. Studying at the RCM also afforded Geoff opportunities to play famous instruments in France, Holland, North and East Germany as well as participating in master-classes with internationally renowned organists such as Dame Gillian Weir and Thomas Trotter. In 2006 Geoff won the Kent Count Organists Association’s inaugural festival in Maidstone earning a recital in Canterbury Cathedral, which took place in April 2007. He has given recitals a many venues including St. Paul’s Cathedral, St.Martin-in-the-Fields, Christchurch Priory and Brentwood Cathedral. He attained his Associateship Diploma from the Royal College of Organists and gave a recital in the Three Choirs Festival in Worcester in 2008. Geoff held the post of Organist and Choirmaster at St. Andrew’s Church, Frimley Green in Surrey from 2004 until 2008 when he took up the position of Organist and Choirmaster at the Royal Garrison Church of All Saints Aldershot. He is also a peripatetic piano and organ teacher a Salesian College in Farnborough, Hampshire and at Edgeborough in Frensham, Surrey and in addition college/accompanist at both. Geoffrey has been the regular rehearsal accompanist for Surrey Heath Choral Society (now Surrey Heath Singers) since January 2009 often performs in their concerts.